HandEra,formerly TRG Products, today announced the HandEra 330, a powerful new handheld computing device for corporate and personal use. The Palm Powered HandEra 330 boasts one of the highest resolution screens of any handheld on the market today as well as a larger viewing area, easy-to-use software and two expansion slots for expandable memory up to one gigabyte, all at a list price of $349.99. The HandEra 330 will be available in Q2 from the company's new Web site at www.handera.com and from select national retail outlets and resellers. "In a market with many new entries, the HandEra 330 distinguishes itself through innovative engineering, high quality and affordability," said Michael Downey, chairman and CEO of HandEra, Inc. "The HandEra 330 is a high-end, superior handheld computing device that is flexible enough for the most demanding corporate environments, yet practical and reasonably priced for everyday use." Demand for handheld computing devices, like the HandEra 330, is more widespread than ever, and corporate adoption of these devices is gaining hold. Increasingly, consumers and enterprises are recognizing the value of handheld computing devices for everything from personal organization to work productivity. "I'm delighted HandEra has selected the Palm OS as the platform for the HandEra 330," said Alan Kessler, general manager of Palm's Platform Solution Group. "The open, extensive architecture of the Palm OS provided a powerful platform on which HandEra was able to innovate, allowing them to add features and capabilities to meet the specific needs of their target customers." The HandEra 330 includes all of the standard personal organizer functions consumers expect from a quality Palm Powered handheld. Because of its wealth of features and add-on capabilities, the HandEra 330 stands out as a true crossover, flexible and powerful enough to accommodate a variety of applications for both corporate and personal use. With crisp, legible text and images, a twenty-five percent larger viewing screen (240 x 320 display) and three times more pixels, the HandEra 330 demonstrates significant advances in screen quality and resolution. 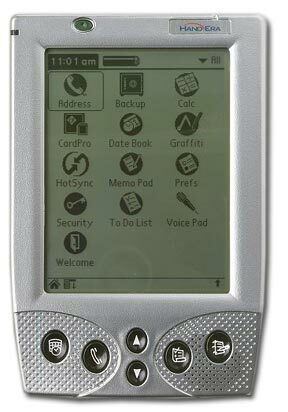 The HandEra 330 is the only Palm Powered device with a quarter VGA (QVGA) screen. Virtual Graffiti offers an additional screen viewing area, while screen rotation allows users to view wider spreadsheet columns, read e-books more easily in landscape mode and view images with fewer limitations. A variety of other screen features unique to the new device include better backlighting, legible inking graffiti, and a broad choice of font sizes. In addition to its 2MB of internal Flash memory and 8MB of internal RAM, the HandEra 330 includes two expansion slots – Secure Digital (SD) and CompactFlash™ (CF) that can be used to increase memory to over 1GB, or to add on a variety of devices and accessories. As a result, users can take advantage of add-ons like wireless modems, Ethernet cards, digital phone cards and bar code scanners, with the additional memory needed to fully utilize these accessories. Additional features of the HandEra 330 include voice recorder and audio capability, one-hand operation, an advanced power system, customization and on-device applications. Voice recorder/audio – One button, easy-to-use operation lets users record and play back voice and audio. The HandEra 330 features the only amplified speaker among Palm Powered devices for superior sound quality. One-hand operation – Using a side-mounted combination jog wheel and select button, a user can efficiently operate the HandEra 330 with one hand for ease of use. Enhanced battery operation – By accommodating four AAA batteries (twice the number of batteries used in comparable Palm Powered handhelds), the HandEra 330 allows for twice the normal operating life of many other handheld computing devices. Users can also replace batteries with an optional rechargeable Lithium Ion battery pack. Customization – Users can customize the HandEra 330 through on-device features such as programmable buttons, and the ability to drop the virtual graffiti area for a larger viewing screen. On-device applications – Popular standard Palm OS applications synchronize with PCs to seamlessly transfer, copy and delete items. The HandEra 330 comes with applications including the Quickoffice™ suite (includes Quicksheet, Quickword and Quickchart), Outlook Conduit and built-in back-up programs. The HandEra 330 will be priced at $349.99 with volume corporate discounts available. The HandEra 330 will be available in Q2 from the company's Web site and at select retail outlets and resellers in the United States and around the world.